WILKES-BARRE, Pa. -- National Weather Service officials confirmed Thursday that two tornadoes had touched down in northeast Pennsylvania late Wednesday night, causing severe damage in one of the region's major commercial corridors. The weather system that created the tornadoes destroyed homes, stores and cars and left at least six people injured. The National Weather Service (NWS) in Binghamton, New York, determined tornadoes had touched down in Franklin and Wilkes-Barre townships. Photos and videos of the aftermath show a shopping center in Wilkes-Barre about 110 miles north of Philadelphia, with roofs torn off, cars overturned and storefronts shattered. The weather service estimated the tornado had a maximum wind speed of 130 mph and said that its damage was consistent with an EF-2 tornado, the third-lowest intensity on the EF scale. Similar photos surfaced Thursday morning from Granville, Franklin and Leroy townships about 90 miles further north of Wilkes-Barre showing collapsed structures and shattered windows. Meteorologist Joanne LaBounty from the NWS in Binghamton said the office planned to release reports with more details from both teams Thursday afternoon. In Wilkes-Barre, city and county officials had closed roads around the damaged shopping centers because of downed power lines and damage to a propane cylinder that was still leaking as of mid-morning Thursday. Luzerne County Emergency Management Agency volunteer Garrett Hittle said crews were working to stabilize the propane cylinder by off gassing the contents. "The scene is not safe enough to have people be able to go in and perform a complete assessment at this point," Hittle said. "It affected between a half-mile and mile radius of mostly business interests." Hittle said there were reports of six storm-related injuries that were not life-threatening and did not require anyone to be admitted to the hospital. Joy Frie told The (Wilkes-Barre) Citizens' Voice that staff and patrons huddled in the kitchen of the bar where she bartends until they could escape to another business. "The doors were busting open. 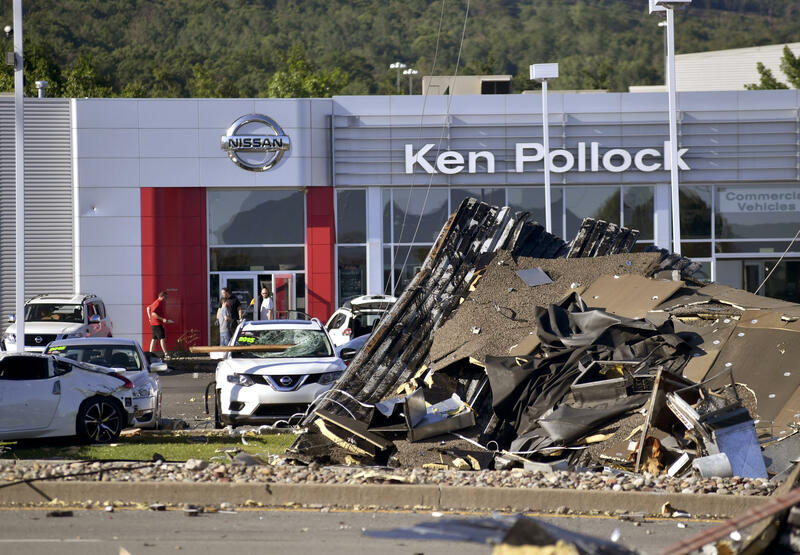 Almost everyone's cars in the parking lot were destroyed," the 18-year-old said. In Bradford County, where Franklin is located, damage was reported in three neighboring townships, but emergency personnel said there were no reports of injuries. Jeff Scarboro, the director of public safety and emergency management for the county, said there were about 10 homes with varying reports of damage, some of which appeared to be destroyed. "There were initial reports of entrapments with building collapses and debris, but local fire departments helped with removal from those properties," Scarboro said.